ART IS EVERYWHERE in downtown Quincy, including right beside Second String Music. Lana Reed, marketing director of the Quincy Art Center, spent hours in the sun Saturday painting the concrete flower bed on the northeast corner of Fifth and Maine. The Art Center is teaming with The District, Arts Quincy, Great River Economic Development Foundation, Home Depot and the Midsummer Arts Faire to paint all 52 flower beds downtown. "I work at the Art Center and I never really get to do much art, so this is fun to do," Lana said Saturday, squinting into the sun and looking at her creation. "It's a great way to do a community service thing and do art at the same time." Some 20 artists are involved, and Lana says she hopes all 52 beds will be painted by July 1. 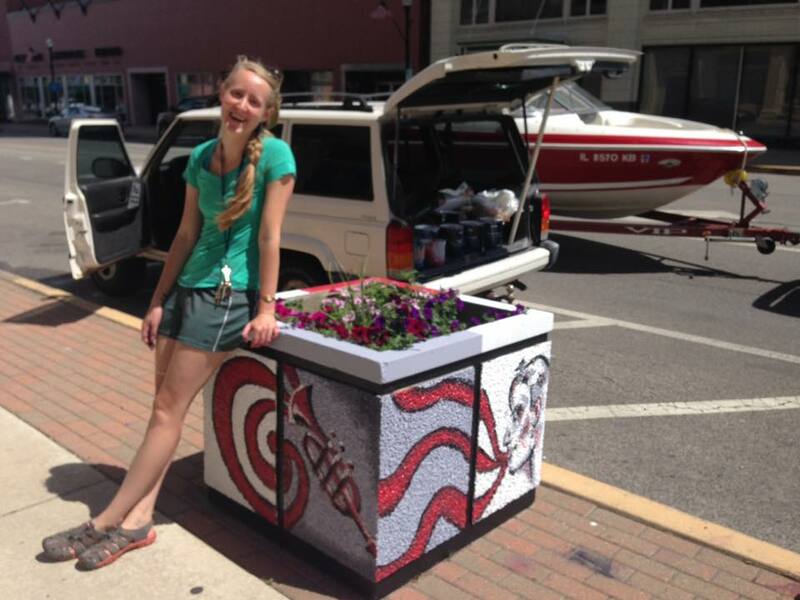 Two other flower beds just up Maine Street in front of Kristopher's were also painted Saturday. Lana chose a music theme for her project, since Blues In The District and the Midsummer Arts Faire takes place right across the street in Washington Park. She painted a guitar, a trumpet, a saxophone and a person singing on the pebbled surfaces. She used good outdoor paint so hopefully the planter paintings last a few years. Downtown was hopping late Saturday morning due to the Quincy Farmer's Market. Seeing people creating art just added to the vibe and reminds us just how cool it is to be in The District. Thank you Lana and the others who were down here Saturday. I'm in awe of people who paint and draw - I do a mean stick figure, but that's about it. Sheryl and I appreciate the efforts to make things a little brighter and more fun down here.